Welcome to The New Fryery on Newtown road, Carlisle. Our family have been serving traditional fish & chips for nearly 40 years, we take great pride in cooking and serving our nations favourite dish exactly as it should be. All our food is cooked in FRYMAX 100% which is filtered every morning ensuring we deliver a clean crisp taste free of any trans-fat vegetable oil. 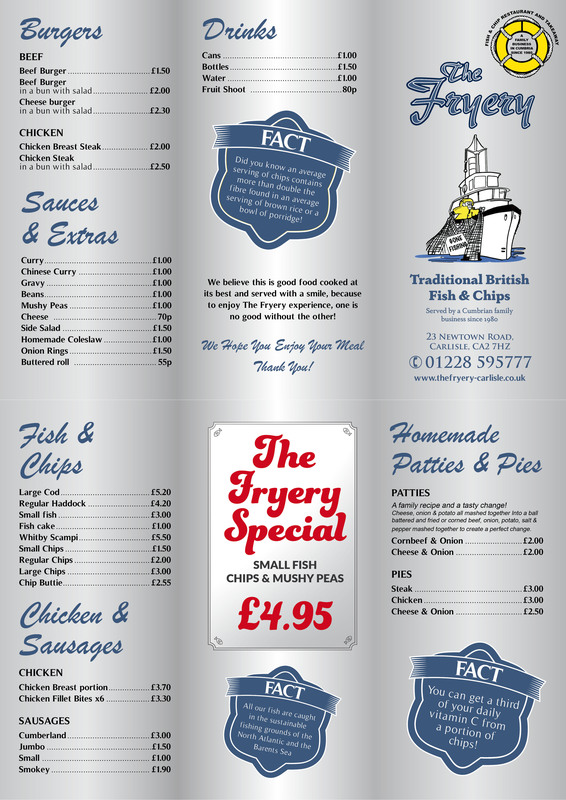 We also serve homemade patties and pies from our own family recipe as well as a range of Burgers, Chicken and Sausage dishes that means there’s something for everyone at The Fryery. We believe our food is good food cooked at its best and served with a smile, because to enjoy the Fryery experience…one is no good without the other! A family recipe and a tasty change! Cheese, onion & potato all mashed together Into a ball battered and fried or corned beef, onion, potato, salt & pepper mashed together to create a perfect change.